Elements Applied: Bark, seeds and leaves are commonly applied in herbal medicine. Active Components: Seed extract is rich in saponins, namely aescin, which is responsible for boosting blood circulation across the body. Aescin provides sufficient blood supply, thus making vein tension strong enough to pump the blood back to the heart. For this reason horse chestnut is successfully used across Europe for weak vein circulation and varicose veins. Aescin is also characterized by anti-inflammatory capacity which is utilized for treating edema especially that associated with trauma, like head injury, surgical operation, and sport injuries. Aescin applied externally is one of the most famous remedies employed for severe sprains which occur at the sport events. Horse chestnut is also known to include tannins, sterols, and flavonoids. Horse chestnut extract has been applied to relieve coughs and fight fevers. Leaves were additionally considered capable of treating inflammation and pains associated with rheumatism and arthritis. Seed poultice was applied externally to heal skin cancer and skin sores. Moreover, the herb was a popular topical and oral remedy for the conditions of poor vein circulation, like hemorrhoids and varicose veins. Externally the herb was applied to cure phlebitis. Used For: Horse chestnut is applied in the following conditions: varicose veins, sprains and other traumas, hemorrhoids, edema, and recurrent vein insufficiency. The herb is widely employed in Europe for treating multiple inflammatory conditions, as well as relieving venous insufficiency problems. Additionally, it is applied for inflammatory processes in the lower extremities, and varicose veins. Horse Chestnut is known to relieve edema. This capacity originates from elevated permeability of veins it leads to. Horse Chestnut leaves are considered potent in relieving chest congestions. Additional Info: Horse Chestnut deciduous tree is indigenous to northern areas of Greece and to Asia, but nowadays it’s specially raised in many regions of North America and Europe. This tree has fruits which are formed as spiny capsules and include one-three seeds, called horse chestnuts. The tree may reach from 50 to 80 feet in height and features complex leaves which are characterized by 5-7 serrate, wedge-formed leaflets. The tree blossoms in late spring and the beginning of summer, when yellow, red, or white flowers appear. The fruit is green-colored and prickly. Conventionally, horse chestnut tree is applied in herbal medicine on a wide scale. Its bark, leaves, and seeds are considered medically potent. Contemporary preparations commonly include seed extract, which is rich in aescin. Preparation and Intake: Conventionally, the dose is limited to 0,2-1 gram of seed extract a day. Still, only commercial standardized preparations should be taken orally. Isolated aescin medications or horse chestnut seed medications which include 16-21% aescin, are commonly suggested at a dose of 90-150 mg a day. When the condition is noticed to decrease, the dose is gradually diminished to 35-70 mg of horse chestnut a day. External aescin medications are applied in Europe for sport injuries, varicose veins, skin sores, hemorrhoids, and different kinds of trauma. 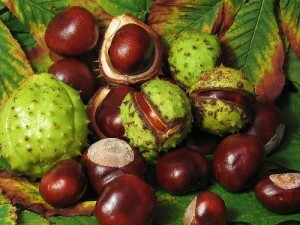 As a relief for varicose veins and hemorrhoids, horse chestnut is commonly mixed with hazel. For an infusion take one teaspoon of bark (taken from branches) for a cup of boiling water. Let infuse for several minutes. In form of powder horse chestnut is used in a quantity of half a teaspoon for hemorrhoids, varicose veins, and diarrhea. To relieve catarrh, use a quarter to half a teaspoon twice a day. To make a bath additive, take 2-2 ½ pounds of chopped fruit and boil it up in water. This mixture is then added to water you’re going to bathe in. Safety: Oral application of commercially produced horse chestnut preparations taken in quantities mentioned above is safe. There are anecdotal cases of kidney failure in people taking too much aescin. Horse chestnut is not recommended to people exposed to liver or kidney conditions. The herb is not suggested for use during pregnancy or nursing period. Applied externally, horse chestnut has occasionally led to skin allergies. Trauma accompanied by swelling and circulatory conditions can seriously damage one’s health, due to which reason one should speak with his/her health-care provider prior to using horse chestnut. When applied in excessive quantities, green capsule outer shell, seeds, and leaves may result in poisoning. To make the seeds safe for consumption it’s recommended to roast them.